Escentric Molecules fragrances are presented in binary pairs. Each pair explores the qualities of one aroma-molecule in two different ways. The Escentric Molecules 02 series explores the ambroxan molecule. This is the man made version of the real ambroxan found in ambergris, as the real thing is costly to extract and is rare. Google ambergris if you don’t know what it is. You’re probably in for a surprise. 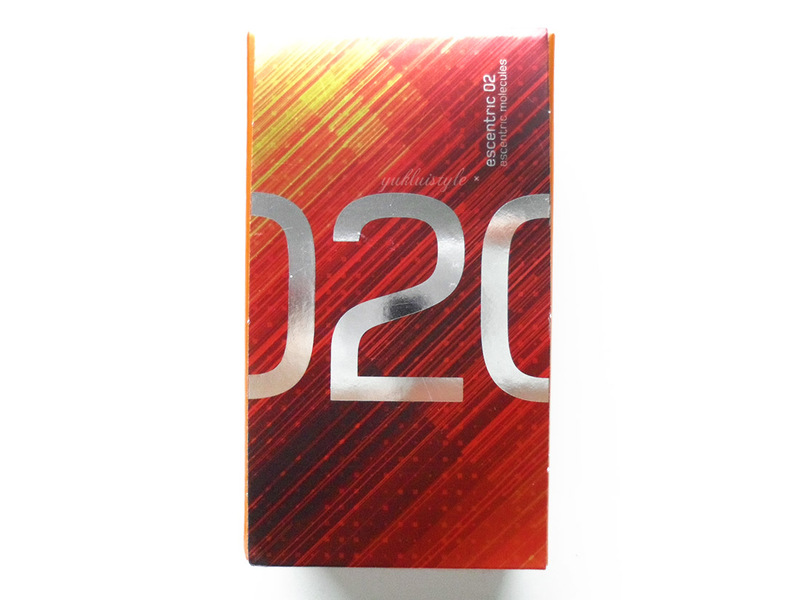 Here I have Escentric 02 to open my mind. To enhance ambroxan, it contains orris, elderflower extract and hedione (green jasmine bud). On the open spray, it’s quite fresh, clean and slightly overpowering. It does have that gin and tonic smell with a citrus twist, and kind of makes me want a Hendrick’s and tonic. It’s like I can taste it. When it dries down, it’s the opposite – warm, subtle sensuality and calm. It’s quite captivating. No gin and tonic whatsoever. I wouldn’t say this is like a perfume that leaves a trail, it’s more like a my skin but better smell. One of those where people can smell it when they’re up close or gives you a hug. When I had thought it had disappeared, others could smell it. Exciting in it’s own way. I can’t really put a timeframe because of this but can say it is long lasting on the skin! I’ve worn this with other perfumes and it helps lift and enhance those perfumes. Oh I feel like a scientist. I’m really not sure what I think of it. It is growing on me though. I’m still perplexed by this but really intrigued and would still wear it. I must admit, it was hard writing this post up, but it’s one of those where you have to try it out with an open mind. This is designed to be for both men and women so don’t fear it being too feminine nor too manly. It’s neither. This is the travel size refill. It also comes in 100ml. You can read more on Escentric Molecules. Have you tried Escentric Molecules? Next Post Barrecore Opens in Leeds! I love unisex perfume and I love the smell of gin and tonic, so refreshing. Wow, this is such an informative one and nice review as well. I'm also fond of perfume, and I'll surely check this out. Thank you for sharing! I've not heard of this range before I'd love to have a chance at smelling it to see if it is my sort of scent. Rachel has this and it is stunning, I think I prefer 01 to this one though. i've never heard of this brand before, but its concept sound so interesting! i wish i can smell the scent through your words though. Oh I love your descrption of how long the perfume lasts for – it sounds like me to a T! This is a new one on me – I love the way you describe the aromas – very evocative! It is really difficult to promote perfumes online because we need the sense of smell. The reaction of perfume is skin is also essential. No I haven't but I would love to. Love the packaging. I haven't heard of this one before, but I always love trying new perfume to find something new. I like that it has a citrus twist in it. It's much more fresher on the scent. I've never heard of this before but it sounds interesting – I love trying new fragrances! I always hear good things about this but I've never given it a sniff! I've never heard of this, but it sounds great! This is interesting. A scent suitable for both men and women. think I will go test it out myself to see if I like it! I've wanted to try this for ages, it sounds so intriguing! Never ever heard of this before. Sounds super interesting though might have to give it a try. I wonder where I can test this out here in Manila? I'd like to smell it for myself! I smelt these fragrances at a store today and they are amazing! I really want one now! I haven't tried this brand of perfume before. It sounds like a really good perfume especially for the season. I am a sucker for jasmine aroma. Its so mesmerizing. I'm sure this would smell great!! That's interesting that the scent changes so much when its wet, lol I like to find a good fragrance…makes me happy. These sounds very fancy indeed…I do like unisex fragrances, I find that they generally last longer on the skin than typically female fragrances!